1. The annual Las Vegas Pride Night Parade will take place Oct. 19 in downtown Las Vegas. There will be a pre-show at 7 p.m. and the parade starts at 8 p.m. Hundreds of colorfully dressed people participate in the parade each year. 2. The husband and wife song and dance team of Michael Kessler and Melinda Jackson, founders of M&M American Dance Theatre, perform Oct. 19 in the Windmill Library Theatre . They'll perform numbers from "Showboat" to "Hamilton" to "Cabaret" to "Lion King." 3. Death Valley Girls perform Oct. 19 at The Bunkhouse Saloon. The group feels less like a band than a traveling caravan. The garage rock/psych-pop/proto-metal troupe is based out of California. 4. The Las Vegas Fashion Council will present artLIVE! at Zappos on Oct. 19. 10 hand-painted, life-size mannequins will be on display and available for purchase. Live fashion shows, live entertainment and delicious food and beverages. Proceeds benefit LVFC's scholarship fund. 5. The Thunderdome Nightmare Ball is happening Oct. 19 at Backstage Bar & Billiards. There will be vendors, dancing, rock music and more. Appearances by The Nuclear Bombshells, Lady Dolore, Lennon Midnight and Artifact Corruption. Gothic attire suggested. 6. Willie Nelson & Family performs Oct. 18 inside The Chelsea at the Cosmopolitan hotel-casino. Nelson has been performing for 60 years. He'll be joined by Lukas Nelson & Promise of the Real. 7. The annual Las Vegas Book Festival is taking place between 9 a.m. and 6 p.m. Oct. 20 at Historic Fifth School. Luis Rodriguez, Sara Shepard and Colson Whitehead will headline the annual festival which is free and open to all ages. 8. The annual Chalktober Fest at Skye Canyon will feature a juried chalk art competition and art fair, local food trucks, live music, a beer and wine station, and a kid-friendly art and fun zone. Attendees can vote on their favorite entry for the People’s Choice Award. 9. More than 60 breweries are participating in this year's Downtown Brew Festival at Clark County Amphitheater on Oct. 20. In addition to 200 craft beers, there will also be great food, live music and more. 10. The 9th annual Aki Matsuri Japanese Festival is happening Oct. 20 at Henderson Event Plaza. Japanese food, karaoke contest, haiku contest, flower exhibit, sake tasting and more. 11. Socktoberfest 2018 on Oct. 20 at ReBar on Main Street is a long-running local private event from Mr. Smiley and Inky Louise that has gone public. Beer specials, ludicrous live accordion entertainment by The Squeezebox Hero, sausages, free bull riding and more. Must be 21 and over, of course. 12. Legendary singer, songwriter, actor and author Rick Springfield is returning to Las Vegas for a special performance at the Grand Events Center at Green Valley Ranch. Springfield's biggest hits include "Jessie's Girl" and "I've Done Everything For You." 13. The Craft Show Spooktacular is happening Oct. 21 at the Silverton. There will be free samples and demos, free drawings, free pop-up games, and lots of arts and crafts. 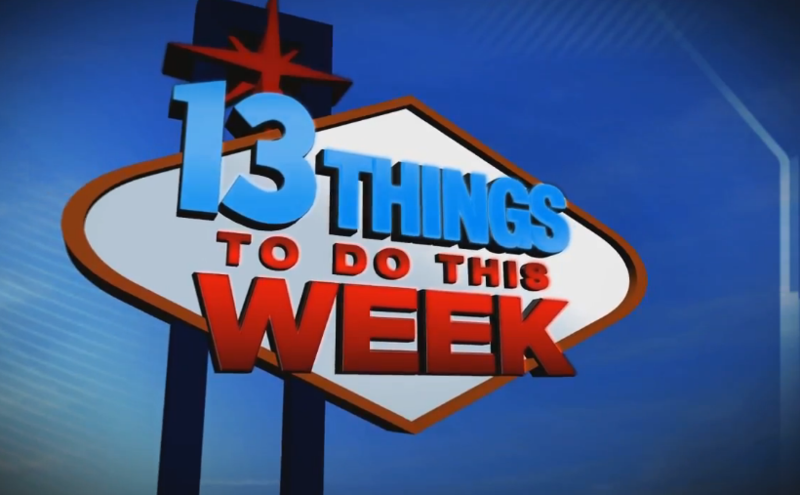 If you would like to submit an item for a future 13 Things list, send a press release to joyce.lupiani@ktnv.com.